'They must be out of their minds' Alhaji Asuman Banda, a reputed Ghanaian businessman and a close pal of President Kufuor has said that government must be out of their mind in deciding to take over the entire $160 million debt portfolio of Ghana Airways at a time when our hospitals are falling apart and students have no dormitories. He noted that as one of the biggest tax payers in Ghana, he has an interest in how government spends tax money and advised government not to spend a dime of public cash on the beleaguered airline. Alhaji Banda made these comments in an exclusive interview with The Chronicle, on the occasion of the first anniversary of Antrak Airline. 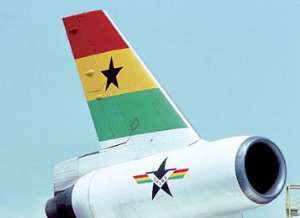 The president's pal said, since government has decided to liquidate the assets of Ghana Airways, it should appoint a receiver who will take over the affairs and assets of the airline and deal with the creditors. When The Chronicle asked for comments on the new Ghana Airways partnership deal with Ghana International Airlines (GIA), he said as far as he was concerned, there was no deal and that the people responsible for the rescue of Ghana Airways were only engaging in verbal semantics. He continued that “you and I know that the government has not got that kind of money. Mr. Banda recalled that when he applied for the license to establish an airline, he indicated that he would only operate if he was given a regional and domestic license but to his surprise, even when the regional license was issued, he was stopped from operating regional flights and asked to operate domestic flights for six months. “To my surprise, when I brought in the aircraft, I was then shown another guideline that I had to do six months domestic flights, already I had committed myself, based on the approval given to me,” Alhaji added. He said that the Sector Minister, Dr. Richard Anane said he didn't recognize the committee that gave him the license. “would you believe that the chairman of that committee is still working with the ministry and he is the one processing my documents, the man that the minister said he did something wrong; he has not been reduced in rank; he has not been removed from that seat, and he is still dealing with me directly, in the capacity as the deputy chief director of the Ministry of Transport. He is doing the atlas job, atlas that the minister does not recognize.” he added. Touching on how far he had gone in respect of the new regional license, Alhaji lamented that even though he has been given a letter for regional flights, since June this year, “the bureaucracy is delaying me up till now I couldn't move”. H said that he has been given a letter signed by the Minister of Transport that his airline has been designated to go to certain areas “but the procedure. The bureaucracy is something that I don't understand”. He noted that “I think the English speaking countries in West Africa are operating differently from the ones from francophone. “In the Francophone countries, if one gets his license, he , he just starts operating the following day. According to him, during the initial attempts to secure a partner for Ghana Airways his company won a competitive bide to take over Ghana Airways under the Dr. Sam Jonah led board. This he said motivated him to set up Antrak Air.